The Hotronix Low Rider Auto Open is similar to the Hotronix STX-6 label press with the exception that the platen sits lower to the workspace. By having a lower platen it is easier to apply labels to garments. 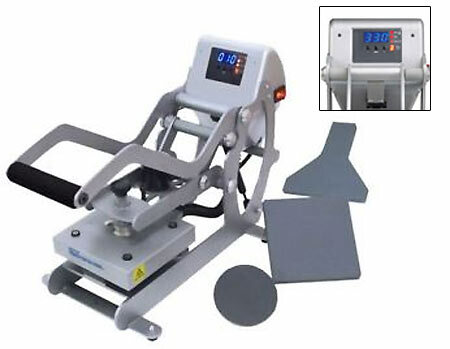 This press is predominately designed for but not limited to label and tagging applications in the uniform and healthcare industry where uniforms and other apparel have to be tagged or labeled. The lower platen makes it easier for the operator to quickly load and label their garments for increased production with less fatigue. The purpose of these different size platens is to accommodate different size labels that might need to be positioned in different areas of a garment like pockets, sleeves or collars. The smaller the label, the smaller the pressing area you want. This way heat and pressure will be concentrated to only the area where the label would go thus eliminating large press marks and slower production. As a label press for the garment industry this press is significantly less expensive than other automatic label press machines but will also provide a quality finished product as well when less of a production demand is required. Cast in tubular heating element every 2" to ensure no "cold spots"
Our Low Price Guarantee On Heat Transfer Press Machines!